The great fishing continues on both lakes Eucumbene & Jindabyne with good numbers and size of fish being caught regardless of method. We had some reasonable rain on Friday & Saturday with up to 20mm falling up in the hills before going to snow on high ground. Both the Eucumbene & Thredbo rivers rose enough to get some more browns to run and we have had quite a few good reports back in from those who fished the rivers over the weekend.We've had a few good fish come in over the last wee with a 6.025kg brown weighed in this morning ( Pictured above ) and a 5.2kg brown from the Eucumbene river mouth on fly last Sunday morning, although we had quite a few fish caught up at Anglers Reach this weekend to 4kgs around the mouth of the Eucumbene river . We could still do with some more rain to get a real run of fish happening so cross the fingers, pray and rub your favourite talisman and lets hope it happens before the rivers close next Monday the 12th of June . Rivers:- Only another week to go - with teh rivers all closing next Monday the 12th of June. We have seen a few more fish move into the rivers with the best fishing still being down low around the mouths of both the Eucumbene & Thredbo rivers. 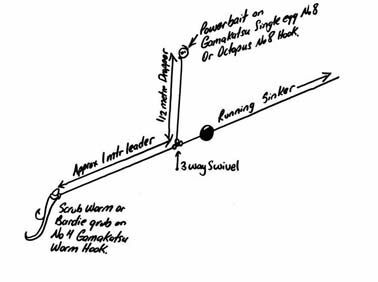 Remembering the rules are different on these rivers at this time of year with each angler being allowed 1 fish a day OVER 50cm.Best technique is to run both a glo bug and nymph together tied off the bend of the hook in-line with the heavier fly at the point so as it will turn over better with out tangling.You then just add a strike indicator to help detect the strikes. The key is to get a drag-free drift with the flies tumbling across the bottom - so keep an eye on your line mending.Now's the time to target that trophy brown - so good luck ! Lake Eucumbene:- Still some very nice rainbows averaging .800 grams to 1kg being caught at present. The rainbows seem to come in for that hour on dusk chasing yabbies and at first light. Steeper shale banks around the dam wall and western shores are well worth a look with some good browns being observed through the timbered areas. The falling lake levels have really got the yabbies moving, so fishing a woolly bugger into the night will help you find the better browns. Lake Tantagara :- No reports this week. Lake Jindabyne:- Had some good reports back in from Jindy over the weekend. Mostly evening fishing with mudeye patterns and streamers like, Craig's Nightime, Woolly Buggers and Fuzzy Wuzzys etc. There has been some good day time fishing as well with buggers and horrors. Area's worth a look include Stinky Bay, Sid's bay, Hatchery Bay, Creel Bay , Snowy arm and Kalkite. *The Sale Flyfishers are currently up , with some great reports back in so far - mostly fishing intermediate lines after dark with lumo flies.Will try and get full trip report at the end of their trip. Eucumbene:- The great trolling continues, just stick to the main launching area's with the falling lake levels ie: Buckenderra - who have put in a new gravel ramp with road base ! Old Adaminaby, Anglers Reach , Breamar Bay and the Dam wall for smaller boats. Both leadlines at 3 colours and flatlines have been producing the goods. The rainbows are in peak condition and averaging around the 1kg mark, feeding heavily on yabby's with the falling water levels, while some better browns have also started to show up as they get itchy for spawning. Consistent lures include Tasmanian Devils in Cols 36,89,55, 72,S12, Y82 & Y62. Our own Alpine Cobra's in the Alpine Special,Pink Wings and Pink Bits patterns, Rebel minnows and crawfish,ultra deep Merlins,Stump Jumpers,Rapala minnows, RMG Scorpions & Poltergeist. *The Sydney Game fishing club had their "Trout Weekend" up at Anglers Reach Lake side Village.The Comp ran from 10am Sat to 10am Sun with 14 boats/teams fishing for 157 fish. The fishing was great with plenty of good browns to 4kgs being caught trolling up towards the Eucumbene river mouth.Some also did very well casting soft plastics from the boat around the margins with Berkley Bass minnows in 3" pumpkin seed and pearl watermelon shad being the pick. *Damien & Mark from Camden fished both Eucumbene & Jindy with flatlines and Tassies in Col S12, Y82 & 55 for 30 odd fish over 4 days , mostly rainbows to 1.2kgs BUT did manage 4 better browns to 2kgs. Jindabyne:- Reports from Jindabyne were mixed this week some anglers did very well while others struggled. Most caught at least a few fish. The best area's were out around the islands in the main basin in front of town & Sid's Bay and East Jindy, up around Waste Point and at the top of the lake around Kalkite. Fishing a mixture of small minnows like RMG Scorpions, Merlins , Rapalas & Attacks along with Tassies in just about all the "Yellow Wing",as well as our own Alpine Cobra's in the Alpine Special & Pink Wings patterns producing the goods. Now is the time to try drifting the river mouth of the Thredbo with bibless rattlers and soft plastics. This technique proved deadly on the browns last season and with a little perseverance can produce some great captures for those willing to try something a little different. The baitfishing has been unbelievable over the last month with incredible catches coming in from Eucumbene. Just about all the main baits have been taking fish with mudeyes still doing well and Power Bait accounting for the most captures. Make sure you pick an area with plenty of weed and some structure like rocks and tree's. Scrub worms fished in conjunction with a Powerbait dropper is still proving to be a popular rig ( Pictured below ).Power bait naturally floats, so the distance you make your dropper is the distance you can expect your Power bait to be above the bottom. This means that fish will find your bait a lot quicker even if you have cast into weeds. If they don't eat the Power bait they have found your main bait a lot quicker. The hook is important when fishing with Power bait and we have a special NEW "circle hook" pattern from Mustad just for the job - which hooks them for you ! Feel free to ask us to go over the rig next time your in if still unsure. *Rory , Rob & Ryan from Canberra fished Frying pan Sunday with Powerbait for 6 rainbows to 1kg , with the best fish being caught spinning with a Snowy Minnow.